~ This is the author page of Amber.S.Lily. Good Morning Everyone. Yesterday I saw this pop up on my subscription list of videos to watch on YouTube. I sadly did not watch it till this morning though, as I was working on my story yesterday. It is the first trailer for the movie that will be coming out in July of next year. Also it is the second ‘part/movie’ if you say to like the modernized version of this epic movies. Most of us will not know that many years ago there were movies made of this already. There is maybe five or 6 of them made, and if anything they will do the same for the new generation version of them. Sadly no I have not seen all of the old ones, but to be honest I have seen maybe one or two as I was growing up. My mom is who introduced it to me in the first place. She also said that it should one of the things that I should get the whole box and watch them with her. No not for her to relive her past, but for me to watch something that was way ahead of its time that it was made in. P.S. That is the same for the ‘Alien’ movies as well. Good Morning Everyone, hope all of Y/you are well this morning. my first post for today is about something that me and millions of other people have been waiting for close to or over two years to come out. 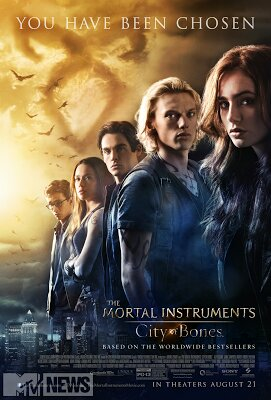 This would be the movie ‘The Mortal Instruments: City of Bones’. i have read all of them, but the last one that will be released this coming March. It has been in theaters since Wednesday, and if all goes well i will be seeing it this Saturday. The second one in the series ‘The Mortal Instruments: City of Ashes’ has been giving the green light to be filmed. It will start filming in Toronto in late September, not even a full month after the first one came out in theaters. P.S. Their is a good chance that i will do my own review of the movie after seeing it. If i do it will go up either Sunday night or Monday night at the latest, if nothing else comes up between then.